PROFESSIONALLY RE-MANUFACTURED 2003-2008 5.7L HEMI ENGINE. 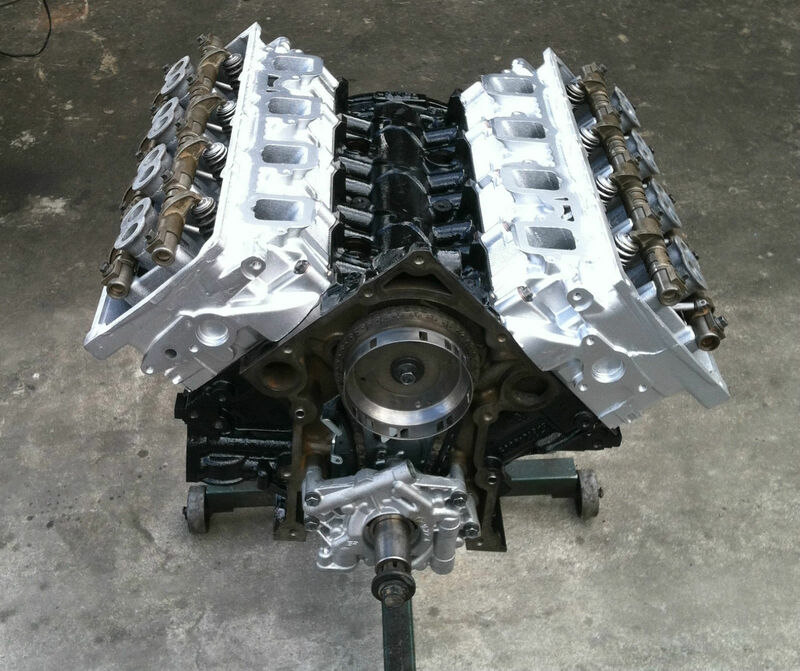 THIS ENGINE HAS BEEN RE-MANUFACTURED (REBUILT) BY JEEP PARTS DEPOT IN SOUTHERN CALIFORNIA. . WE SPECIALIZE IN JEEP AND CHRYSLER REBUILT ENGINES AND PARTS SINCE 1994. INCLUDES ALL GASKETS NEEDED TO PERFORM THE INSTALLATION. PLEASE INSPECT THE ENGINE VISUALLY AND MECHANICALLY VERY THOROUGHLY AND UPON RECEIPT AND IF YOU SEE ANY ISSUES AT ALL DO NOT INSTALL THE ENGINE. CONTACT US IMMEDIATELY AND WE WILL REPLACE THE ENGINE FREE OF CHARGE. WE USE ALL GENUINE AMERICAN MADE HIGH QUALITY PARTS. LABOR IS PERFORMED BY AN EXPERIENCED PROFESSIONAL AND ENTIRE ENGINE IS TORQUED TO FACTORY SPECIFICATIONS. WARRANTY:ALL ENGINES COME WITH A 12 MONTH OR 12K MILES WARRANTY ON PARTS ONLY. NO LABOR REIMBURSEMENT, OVERHEATING DUE TO EXTERNAL PART FAILURE WILL VOID THE WARRANTY. INTAKE MANIFOLD IS REQUIRED TO BE REPLACED AS PER MANUFACTURE(CHRYSLER) REQUIREMENT. FAILURE TO DO SO WILL CAUSE SEVERE DAMAGE TO THE NEW ENGINE AND WILL VOID THE WARRANTY. FULL SET OF GASKETS AND SEALS ARE PROVIDED FOR INSTALLATION. INSTALLER IS RESPONSIBLE FOR OIL LEAKS SINCE WE DO NOT INSTALL ANY GASKETS OR SEAL. (IN SOME ENGINES THE REAR MAIN SEAL COMES ALREADY INSTALLED. PLEASE HAVE INSTALLER RECHECK THIS SEAL BEFORE INSTALLATION SINCE WE WILL NOT BE RESPONSIBLE FOR ANY LABOR DUE TO OIL LEAKS). ENGINE OIL MUST BE REPLACED AFTER THE FIRST 1K MILES AND THEN EVERY 3K MILES TO ENSURE PROPER LUBRICATION. ENGINE MUST BE INSTALLED BY A PROFESSIONAL CERTIFIED SHOP AND INSTALLER AND REGULAR MAINTENANCE PERFORMED. PROVE OF MAINTENANCE MUST BE PROVIDED IN CASE OF A WARRANTY CLAIM. IN CASE OF A WARRANTY CLAIM: WE WILL ASK TO SPEAK WITH THE CERTIFIED INSTALLER AND HE WILL BE ASK TO PERFORM SOME TEST TO DETERMINE THE CAUSE OF THE FAILURE. WE WILL NEED RECEIPT OF INSTALLATION FROM THE CERTIFIED INSTALLER. (SHOWING VEHICLE VIN NUMBER ,MILES,YEAR ,MAKE AND MODEL. RECEIPT OF PURCHASE FOR THE NEW INTAKE MANIFOLD. PICTURES OF HEAT TABS. (TO DETERMINE IF THE ENGINE WAS OVERHEATED) HEAT TABS ARE IN PLACE. MELTED HEAT TABS WILL VOID THE WARRANTY. TAMPERING WITH THE HEAT TABS WILL ALSO VOID THE WARRANTY. OVER HEATED ENGINES ARE OUT OF WARRANTY.YOU ARE RESPONSIBLE FOR HOSES, RADIATOR, HEATER CORE AND ANY OTHER ACCESSORIES THAT MAY CAUSE THE ENGINE TO OVERHEAT. THE ENGINE WILL BE SHIPPED VIA FREIGHT COMPANIES, ENGINES ARE STRAPPED TO HEAVY DUTY PALLETS OR CRATES AND WRAPPED IN PLASTIC. THIS ENGINES ARE FULL INSURED BUT CUSTOMER IS RESPONSIBLE TO CHECK FOR EXTERNAL DAMAGE AT THE TIME OF DELIVERY, SHIPPING COMPANIES WILL ONLY ACCEPT CLAIMS IF THEY ARE NOTIFIED AT THE TIME OF RECEIVING THE ENGINE AND NOTED IN WRITING. PLEASE DO NOT ACCEPT A DAMAGED ENGINE IF THE PACKAGE IS DAMAGED. FAILURE TO DO THIS WILL MAKE YOU LIABLE FOR ANY EXPENSES RELATED TO THE DAMAGE SUCH AS PARTS, LABOR AND OR SHIPPING. SHIPPING RATE IS BUSINESS TO BUSINESS WITH FORKLIFT OR LOADING DOCK ACCESS . IF YOU DONT HAVE ANY OF THIS; YOU MUST MAKE ARRAINGMENTS TO PICK UP AT LOCAL SHIPPING TERMINAL YOURSELF. $500.00 CORE WHICH IS REFUNDABLE WHEN CORE IS RETURNED IN GOOD CONDITION. The engine is sold exchange and requires a core deposit of $500.00 to be added to the final price. The core deposit will be refunded upon return of your old engine core. To receive core credit the engine core must have no visible external holes or case damage as well as no missing or broken tabs, complete and assembled. Customer is responsible for core return shipping. Shipment to Continental US only. Can Not be shipped overseas or outside of the Continental US! THERE WILL BE A 20% RESTOCKING FEE FOR RETURNED ITEMS OR CANCELLED TRANSACTIONS. SHIPPING WILL NOT BE RETURNED IN CASE OF CANCELLATION, AND CUSTOMER WILL BE RESPONSIBLE FOR SHIPPING ON RETURNS.